Astonishingly we've had a good few sunny days here recently. So sunny in fact that our friends had a barbecue and we all sat outside with a cooling drink eating sausages. 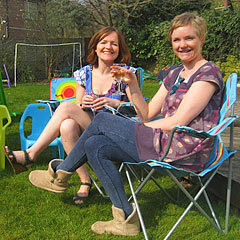 And here's a photo of my wife and her friend enjoying that sunshine. Will it last until November? Amateur meterologists please send in your predictions! Also quite astonishing is the creativity of photographers. And don't let anyone tell you that creative photography is a dark art that only a few can master! Like most things you can learn to be more creative with your photography. Here's a few tips to get you started. The most important tip to train yourself to be more creative is to look at the world from a new angle. It could be very close up on an everyday object, ground up, or top down. Try all of these and you will find it completely changes your photos. Play with the perspective - things nearest to the camera will appear larger than things further away. Use this to line up unusual objects. 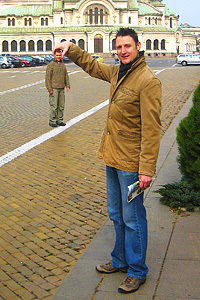 The photo here is me holding up a minature friend. Place objects together that don't normally go together - an single bright orange set amongst a collection of apples. Freeze movement by using a fast shutter speed - this captures movement that is normally too fast for the human eye to register. Use a slow shutter speed - anything that moves whilst the shutter is open will blur, everything stationary will remain in clear focus. Seek out repeating patterns - this could be anything from a stairwell to railings or even just windows on a building. The creative photography page goes into more detail on each of these techniques. As always, now you have the basic concept, have a go at creative photography yourself!